Featuring a series of original 16 mm Marion Steam Shovel Co. and Marion Power Shovel Co. films that have been grouped and transferred to DVD, these films are from the Historical Construction Equipment Association archives. These black & white and color films include a broad array of Marion machines from the 1920s through the 1960s. 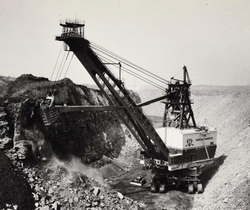 B&W covers Model 70 and 92 railroad shovels (mounted on crawlers), Type 490, 4160, and 350 shovels, Type 360 dragline and more. Color films include models 37-M, 43-M, 93-M, 111-M and many more models with various mountings including shovels, draglines, backhoes, clamshells, cranes, pile drivers. The famous Marion 5760 stripping shovels are also shown including “The Mountaineer”, “Big Paul”, and the “Coal Chief”. 1.5 hrs.